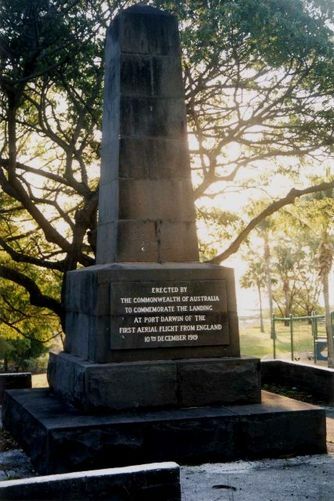 The monument commemorates the landing of the first aerial flight from England to Port Darwin in 1919 by the Australian aviators Ross and Keith Smith and their crew. The flight took 27 days and 20 hours in a Vickers Vimy landing in Darwin on December 10, 1919. It earnt the brothers a £10,000 prize offered by the government to the first Australian airmen to complete the flight in less than 30 consecutive days before December 31. The unveiling of the monument to the late Sir Ross Smith took place last Sunday at Fannie Bay, over three miles from Darwin, where the aerial flight from England to Australia was completed. A large crowd of people went out from Darwin and Parap in motor cars and other vehicles, and pedestrians arrived from all around. The Darwin Brass Band played a number of selections, after which a landing party from the Naval survey sloop Geranium, towed by a small-launch ,came ashore while the sloop was lying at anchor in the bay. A contingent of school children, under the direction of Mesdames Ward and Herkes, sang, "Now pray we for our country". The Minister for Home and Territories (Senator Pearce), in his address, gave a brief resume of the flight undertaken by Sir Ross Smith and Sir Keith Smith, Lieut. Shiers and Lieut. Bennett. The Queenslander (Brisbane), 26th May 1923.